Nestled in the beautiful New River Valley region of Virginia, Montgomery County is a progressive, technology-driven community with an abundance of outdoor amenities. The county is home to Virginia Tech - an internationally renowned research university - and the Towns of Blacksburg and Christiansburg. The community is the perfect place to live, raise a family and grow a business. Don't just take our word for it, here is what others are saying about our community. Blacksburg named the No. 1 "Best Southern College" (2016). **Readers' Choice Winner** Blacksburg voted the "Best College Town in the South" by Southern Living Facebook fans. Blacksburg voted "Safest City in Virginia" by the National Council for Home and Safety Security (2018). Christiansburg named 3rd "Happiest City in Virginia" (2016). Blacksburg named the 7th "Best City for Singles" (2016). Blacksburg-Christiansburg-Radford Metro named one of the top 72 “5-star Quality of Life Metros” in the United States (2007, 2006 and 2005). Blacksburg recognized as a “Top 50 Place to Live” (2005). Blacksburg named a “Top Ten Dream Town for Outdoor Enthusiasts" because of its proximity to the Appalachian Trail and the Washington-Jefferson National Forest. (2001). Blacksburg-Christiansburg-Radford Metro ranked the the No. 2 "American City Adding Jobs" by 24/7 Wall St (2012). In 2016, the Blacksburg MSA ranked 30th in the nation for "Leading Locations" and ranked 12th in mid-sized metros. The Blacksburg MSA was one of only two metros in Virginia to make the Top 100 list. For the prime workforce indicator, the Blacksburg MSA ranked 4th in the nation (Area Development Magazine, 2016). Blacksburg-Christiansburg-Radford Metro named 5th “Best Small City for Jobs” (2012). Virginia Tech ranked "38th among 697 academic institutions" for it's almost $400 million in research expenditures in fiscal year 2009 (National Science Foundation 2015). Virginia Tech ranked 10th among universities globally on the “IEEE Spectrum Patent Power Scorecard,” which analyzed the strength of patent portfolios for calendar year 2009. During fiscal year 2010, 37 U.S. patents and 7 foreign patents were awarded to Virginia Tech Intellectual Properties and 44 license and option agreements were signed (2010). Blacksburg ranked 43rd “Best Place to Live and Launch" (2008). Blacksburg named to list of "6 Tech Launching Pads" (2008). VT KnowledgeWorks dubbed "Most Promising New Incubator" at the 2008 Science Alliance Conference on Best Practices in Science-Based Incubation. The Blacksburg-Christiansburg-Radford Metro designated a "5-Star Business Opportunity Metro” (2006). Blacksburg-Christiansburg-Radford Metro listed as one of 74 “Five-Star Knowledge Worker Metros” (2005). Blacksburg-Christiansburg-Radford Metro ranked the 18th “Fastest Growing Retail Market” from 1998 to 2003 (2005). Blacksburg-Christiansburg-Radford Metro ranked the 8th “Best Emerging Metropolitan Statistical Area” (2004). The Virginia Tech Corporate Research Center was named one of three national finalists for the "Excellence in Technology-led Economic Development Award" granted by the Economic Development Administration of the U.S. Department of Commerce (2004). Virginia Tech Corporate Research Center named "Best University Research Park in the South" by Southern Business & Development magazine (2016). Montgomery County Public Schools designated a “Best Community for Music Education” for the tenth consecutive year by the NAMM Foundation (2017). Wall Street Journal report ranks Virginia Tech among the "Top 25 Schools for Best-Qualified Graduates" (2010). Blacksburg High School - a Montgomery County Public School - ranked in the “Top 5% of the Nation's Schools” (2003, 2008 and 2009). Blacksburg ranked 14th on Forbes' list of "America's Most Educated Small Towns" (2009). Blacksburg-Christiansburg-Radford Metro ranked the 2nd "Top Metro for Ph.D.s Per Capita" (2005). Blacksburg ranked the 3rd in "metros with high ratio of IT graduates to IT job base" (2017). Christiansburg Aquatic Center named one of 13 "World-Class Aquatics Facilities" in Aquatics International's Best of Aquatics issue (2011). Bowl Championship Series (BCS) appearances by Virginia Tech “Hokie” football: Sugar Bowl National Championship Game (1999), Sugar Bowl (2011 and 2004), Orange Bowl (2010, 2008, and 2007), Gator Bowl (2000, 2001, and 2005), San Francisco Bowl (2002), Insight Bowl (2003), Chick-fil-A Bowl (2006 and 2009), Russell Athletic Bowl (2012), Sun Bowl (2013), Military Bowl (2014), Independence Bowl (2015), Belk Bowl (2016), and Camping World Bowl (2017). Lane Stadium - home of Hokie Football - named 20 "Top 25 College Football Stadiums" (2016). The Poverty Creek Trail System at Pandapas - a 17-mile trail system that traverses Brush and Gap mountains in Jefferson National Forest - named a "Best Mountain Bike Trail" (4th 2010 and 3rd 2008). Pandapas Pond - an 8-acre manmade pond in Jefferson National Forest - named a "Best Running Trail" (2010). Cascade Falls - a 69 ft. waterfall in Giles County - 4th "Best Swimming Hole" (2010). Carvins Cove Reserve - 30 miles of hiking and biking trails in nearby Roanoke, Va. - named the "Best Urban Park" (2010). Explore Park - located off of the Blue Ridge Parkway in nearby Roanoke, Va. - named the 2nd "Best Mountain Bike Trail" (2010). Dragon's Tooth and McAfee Knob - located in nearby Roanoke, Va. - named "Favorite Sections of the Appalachian Trail." (2010). FloydFest - a world music and arts festival held annually in Floyd County - named a "Top 20 Outdoor Festival" (2008). Virginia Tech Sports Atlantic Costal Conference (ACC) Championships - Football (2010-11, 2008-09, 2007-2008, 2004-2005), Softball (2007,2008), Men’s Indoor Track (2010-11, 2012-13, 2014-15, 2016-17), Women’s Indoor Track (2006-07, 2007-08), Women’s Outdoor Track & Field (2007, 2008, 2017), Men's Outdoor Track & Field (2012, 2016, 2017), Men's Cross Country (2012), Men's Golf (2007), Men's Swimming/Diving (2013-14), Wrestling (2012-13, 2013-14, 2016-17). Virginia Tech joined the ACC in 2004. NCAA Tournament appearances by Virginia Tech men's basketball: 2017 (9 seed), 2007 (5 Seed), 1996 (9 Seed), 1986 (7 Seed), 1985 (9 Seed), 1980 (7 Seed), 1979 (8 Seed), 1976, 1967 (Elite 8). Virginia Tech men's basketball wins over #1 ranked team in the country: 2011 (Duke), 2009 (Wake Forest), 2007 (UNC). Lane Stadium - home of Hokie Football - named the "Toughest Place in College Football for Opponents to Play" (2005). The New River - which makes up Montgomery County's western border - is the oldest river on the North American continent and second only to the Nile River in Africa as the oldest river in the world. Blacksburg-based companies Modea (#521), UXB International (#1,854) and Harmonia (#4,800) named to Inc. Magazines’ list of the "5,000 fastest-growing privately held companies in the United States" (2011). Blacksburg-based Intrexon named by FierceBiotech as one of 2011’s "Fierce 15," designating it as one of the most promising private biotechnology companies in the industry. Tuck Chiropractic Clinic - headquartered in Blacksburg - was recognized as one of Virginia’s "Fantastic 50" by the Virginia Chamber of Commerce (2011). Montgomery County businesses/leaders take home five of eight awards from the 2017 Roanoke-Blacksburg TechNite Banquet: Thomas "Tweeks" Weeks, Virginia Tech Cyber Range (Regional Go to Geek Award), Nick Cornwell, Shawsville Middle School (STEM-H Educator Award), Josep Bassaganya-Riera, BioTherapeutics (Innovator Award), Qualtrax (Rising Star Award) and FluxTeq (People's Choice Award). Modea and Tuck Chiropractic Clinic - both headquartered in Blacksburg - were named a 2012 "Best Places to Work" by Virginia Business. Blacksburg startup Modea wins "Best Agency Culture Award" by AdAge for the 2011 Small Agency Awards. Attimo Winery, located in Christiansburg, Virginia, won a "Double Gold and Best in Class" for their Sonnet 98, a 2010 Vidal Blanc, in the 2011 International Eastern Wine Competition. Blacksburg-based Adaptive Technologies, Inc. (ATI) was recognized as one of Virginia’s "Fantastic 50" by the Virginia Chamber of Commerce (2009). Blacksburg-based companies Modea (#221) and Harmonia (#4,474) were both named to Inc. Magazines’ list of the 5,000 fastest-growing privately held companies in the United States (2010). Virginia continues as a leading state in the Forbes.com "Best State for Business" review. The review examines multiple objective measurements, including business cost, regulatory climate, quality of the workforce, and economic growth. Virginia took the top spot in 2006, 2007, 2008, and 2009 and ranked second overall in 2010 and 2011. Forbes.com is the official Internet site of the Forbes family of business publications. Virginia ranked 5th "Best State for Business" in 2017. Out of 50 states, Virginia moved up six spots for the 2016 rankings to place number 7 in CNBC's "Top States for Business 2017". The review ranks states according to 10 broad categories weighted on how frequently each category is used as a selling point for the state in their economic development marketing materials. These categories include workforce, infrastructure, cost of doing business, economy, quality of life, technology and innovation, education, business friendliness, access to capital, and cost of living. Out of the ten categories, Virginia ranked very well in both workforce, placing 2nd, and business friendliness, placing 7th, out of all 50 states. Virginia is ranked the 2011 Top Pro-Business State by Pollina Corporate Real Estate. This is the third consecutive year that Virginia placed first, topping the 2011 ranking by the largest victory margin in the history of the study. 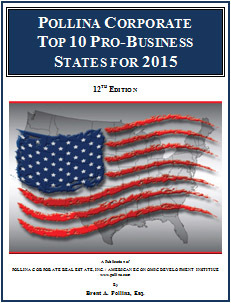 The Pollina Corporate Top 10 Pro-Business States study examines 29 factors relative to states’ efforts to be pro-business, and is the most comprehensive examination of states to date. The study is limited to factors over which state government has control. The list reflects state leadership that truly understands the importance of producing the best job opportunities available for their constituents. The state governments at the top of the list understand that they must be very proactive in the international battle to keep and attract jobs. In total, this marks the fifth time the Commonwealth has held the top spot with previous top rankings garnered in 2003, 2007, 2009 and 2010. Virginia named the "Best State to Make a Living" in 2012. In jumping from fourth to first over 2011, Virginia improved its adjusted average income figure by $2,557. This year, Virginia enjoyed a best-of-both-worlds scenario in which its average income rose while its cost of living fell slightly. The state also saw its unemployment rate drop to 6.2 percent, which is well below the national average.